One day in high school my best friend asked me to have a drink with him. He informed me that he had just had his visa cancelled and had to return to the States. In one way I was thrilled not to have competition with the girl we both liked, but I was sad to lose a friend. I accompanied him to the airport and we were having a drink at the departure lounge when I remembered his motorcycle. “What did you do with your Ducati?” I asked. I reached into my pocket and pulled out the equivalent of $9 in Spanish coin. “Give it to me. The bike is yours.” He said as he pulled the registration ticket out of his pocket and handed it to me. That is how at 17 I acquired my first mode of serious transportation. This was the only thing we were legally allowed to drive before turning 18 in Spain. I was free at last. I now owned the Ducati 50 Sport. I had to bribe the guy who ran the garage in my building so he would let me hide it in the garage. My parents would have had a conniption, had they found out. 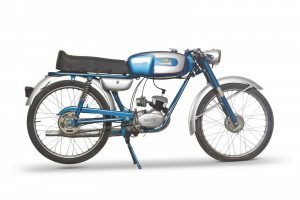 Ducati was manufacturing a 50 cc two stroke engine with a about 4 hp output. The bikes were designed as cafe racers, a look that was very popular in Europe, and which I had lusted for since I first saw one when I was 11. Every day I explored Madrid. I ventured far and wide and thought I was the coolest guy in town. One day my class had a school trip to a farm in the country about an hour outside of Madrid, and I decided to take my Ducati instead of the school bus. On the way back the front mudguard got loose and the rear portion jammed itself between the tire and the fork. Instantly the front wheel locked itself, and I found myself sliding on the tarmac at 50 mph (80 kph -the max) with my bike sliding right next to me. Bad day. 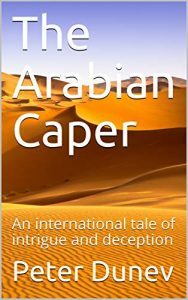 When we stopped, my elbows, knees and hips were scraped virtually to the bone. The front wheel was egg shaped, and the gas tank was also scraped, with a hole big enough to let the gas pour out. Also the rear view mirror was knocked off. Other that that it was fine. When I stood the bike up, I noticed that the hole on the gas tank was high enough that the rest of the gas would not escape. I was ready to drive back. I was going to ignore the pain that was starting to come over me once the adrenalin stopped kicking in. The max speed I could drive was about 30 kph, with the deformed wheel. Now the pain was severe. Every bounce of the tire, caused spasms in my hip, where I appeared to have done the most damage. I knew that if I stopped I would not be able to get on the bike again. Then I heard the familiar police siren behind me. I looked back and saw a police car asking me to pull over. I though I was saved and these cops would find a way to help me get home. Wrong again. I explained that I’d had an accident and was trying to get home. Not a smile from the cop, as he proceeded to write me a ticket for driving without a rear view mirror! When he pulled away I needed to find, deep inside me, the strength to mount my broken chariot and limp home. I don’t know how I made it, but I did. Fortunately my parents were out for the weekend, and I was able to immerse my self into a warm bathtub long enough to dissolve the tar, dirt, clothes, and blood from all my road rash. I had parked my Ducati on the street by my house that fateful day, but a few days later when I went to check the damage, the bike was gone. As a side note, I should tell you that the scar on my hipbone healed and I was able to show it to girls afterwards and say it was a bullfighting scar, when I was gored by a bull. In those days in Spain, bullfighters were the superstars.